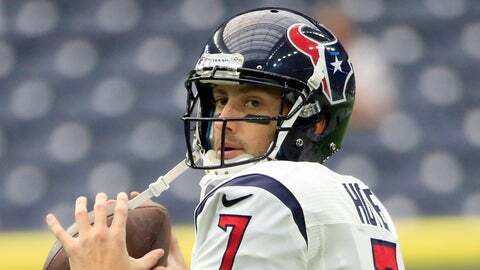 Brian Hoyer's debut as the Texans' starting quaterback didn't go so well. It didn’t take long for Brian Hoyer to learn his margin for error as Houston’s starting quarterback might be slim. Hoyer, who beat out Ryan Mallett for the Texans’ starting job in training camp, struggled in his debut Sunday and was pulled in the fourth quarter during team’s 27-20 Week 1 loss to Kansas City. Now, head coach Bill O’Brien may once again have a decision to make at starting quarterback heading into Week 2. Hoyer, who signed with the Texans as a free agent in the offseason after spending last year with the Cleveland Browns, threw an interception on his first play that led to a Kansas City touchdown. Things didn’t improve much from there, as the seven-year veteran completed 18 of 34 passes for 236 yards with one touchdown and one interception. Hoyer was sacked four times and lost a fumble as well. With Houston down 27-9 with just over six minutes remaining in the fourth quarter, O’Brien benched Hoyer in favor of Mallett. The Texans then went on a seven-play, 59-yard drive with Mallett under center, culminating in an 8-yard touchdown pass to wide receiver DeAndre Hopkins. Mallett also led another drive late in the game that resulted in a field goal. The 27-year-old Mallett finished the day 8-of-13 for 98 yards and a touchdown. It remains to be seen who will be the starter when the team faces Carolina next week, but both Mallett and Hoyer appear to have given O’Brien something to think about.